A beginners guide to training for a 5k | Fit Girl. Happy Girl. ← Kickboxing: Best. Workout. Ever. Never in my life would I have considered myself to be a “runner.” I only ran in high school for sports practice and rarely ran other than that. When I started my 5k training I was in relatively good shape already- doing kickboxing three or four times a week, with regular weight and cardio days in between. However, for some reason I always wanted to run a road race. My dad was a marathoner back in his heyday, he ran a total of 16 marathons (including eight Boston Marathons) among other smaller races. This had to be a good sign for me then, running ran in my blood. I had heard of these “couch to 5k” programs and thought maybe that would be a good place to start. Since we live in a Mac world, I immediately sought the assistance of my iPhone to find an app that would help me get started. There are tons of “couch to 5k” apps in the app store but I settled on the “Get Running” app because the reviews seemed good. The app works especially well when you plug in your headphones- a woman’s voice will guide you through the run and tell you when it’s time to walk and when to cool down and stretch. I am on week 4 and so far so good! 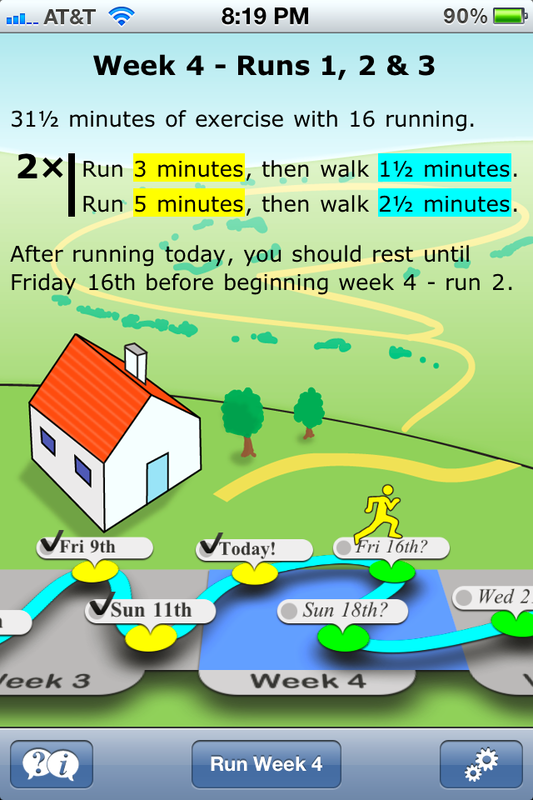 Screen shot of the "Get Running" app. The problem most beginner runners have is that they start off too fast and too strong and get winded very quickly. The goal of the “couch to 5k” program is to ease beginners into running by doing a series of interval training, mixing running and walking, with rest days in between. A lot of beginners become overly ambitious and focused on the mileage they run but it’s really better to take it slow at first and build up endurance to get to your goal. Since I started running I have become obsessed, I guess that’s what you would call a “runner’s high.” I have registered for a 5k for June 3rd in Hampton, N.H. and am hoping to reach a goal of under 30 minutes. I think it’ll be doable but only time will tell. I will keep you updated as I continue with my training. Happy running! Hey, good luck making your goal. I’ve set myself the same goal of completing a 5k in under 30 minutes. I began running in January, and my 5k is this saturday! That’s so exciting and great to hear! Good luck on Saturday!